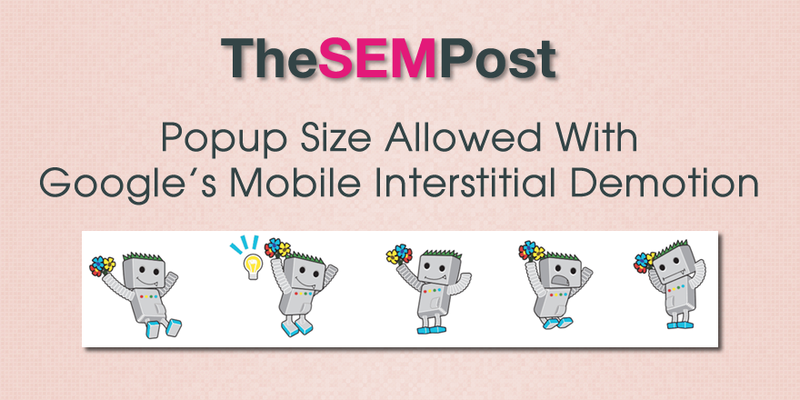 When Google launched the mobile interstitial and popup demotion, where pages that utilize either an interstitial or intrusive popup, many speculated about just how big a popup could be, before the demotion was triggered. Because Google still shows a page as being mobile friendly, even with an interstitial or popup, site owners couldn’t use that as a test to check. John Mueller commented yesterday that they won’t say how big a popup could get before it would trigger the demotion. After all, if site owners knew how big it could be, down to the pixel size, then undoubtedly, many mobile pages would have popups that were exactly that size and no smaller, which isn’t exactly great for user experience. I don’t have any explicit percentage numbers I can share there. He did reveal that using the app banner size as a popup would be a safe way to go. I’d recommend looking at things like the normal app banners, I believe Safari has a standard app banner, and something around that size. So if you want to play it safe while still having some kind of popup or overlay, app banner size or smaller should be the choice.